LG has long attempted to differentiate itself from the competition, but the company has sort of fallen short in years past. Last year’s G4 was a phenomenal phone, but it didn't stand out. With the debut of its latest device at Mobile World Congress on Sunday, it’s clear that LG is trying an entirely different approach this year. Rather than lead its flagship reveal with a long list of specifications and the hardware it’s iterated on, LG is hoping you’ll look at the G5 and think of it as more than just its fifth-generation flagship. Instead, LG wants you to think of its new phone as a fun device. 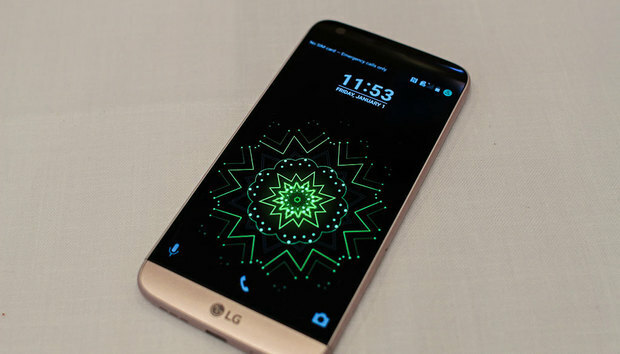 The G5 boasts new always-on capabilities that LG says consumes less than a percent of battery an hour. Let’s get some of the basic specifications out of the way: The G5 runs on a Snapdragon 820 processor with 4GB of RAM. It has a removable 2800mAh battery pack and 32GB of internal storage, as well as an expansion slot. It sports dual rear-facing cameras, including a main 16MP camera and a secondary wide-angle 8MP camera; it also has an 8MP front-facing camera. LG also embedded a fingerprint scanner into the power button on the back, though it moved the previously rear-facing volume rockers to the left-hand side of the chassis. Sadly, the G5 does not have wireless charging, though it does support Qualcomm’s QuickCharge 3.0. The power button on the back features an embedded fingerprint scanner. The back side of the G5. The camera sensors don’t actually protrude as much as they seem to in photos. Rather than adopt the same thick leather-and-plastic construction as last year’s G4, LG opted for a flat, unibody aluminum design that’s quite a looker. It’s not what I expected from LG, considering the masculine look and bulky feel of its predecessor, but I’m happy to report that the G5 is one of the lightest smartphones I’ve held in a while. It’s thinner, too, and a bit smaller than its predecessors due in part to its 5.3-inch Quad HD display. No, the G5 isn’t broken, but does feature a slide out battery. Now, here’s where LG threw a wrench into the typically formulaic smartphone announcement: The G5 features swappable modules. The idea is that the ability to customize your phone will eventually help you “wake up your play instinct.” It didn’t exactly inspire me in that manner, but it’s nice to see something completely different from a company that typically plays it safe. Also, it’s fun swapping out modules, even if you have no idea why you’re compelled to do so. This small button on the side of the G5 releases the battery tray, so you can slide it out and swap in other modules. Here’s how it works: There’s a small button on the left-hand side of the G5 that releases the main tray, which you can then slide out to reveal the 2800mAh battery pack. If you want to swap it for another module with more functionality, simply remove the battery pack and then shove it into whatever module you have available to you. You can take out the 2800mAh battery and plug it into the Cam Plus module, which adds an extra 1200mAh. The G5 battery and its compatible trays. At launch, there will be two modules to choose from: the Cam Plus, which tacks on four physical camera buttons and an extra 1200mAh battery pack, and the Hi-Fi Plus with Bang & Olufsen Play, which adds 32-bit high-definition audio playback capabilities to the G5. I didn’t test out the Hi-Fi Plus, but I did swap in the Cam Plus module. I liked the extra camera functionality, like the physical shutter button and the dedicated button for recording video. It’s easier to adjust the settings than simply touching the screen, and the extra grip afforded me greater control over the phone as I was framing photos. I also appreciate that LG is leveraging the camera capabilities it became known for with last year’s G4 and V10. I’ll admit that I spent entirely too much time figuring out how to use the modules on the G5, so I didn’t delve too much into LG’s new software interface. However, I did notice LG made one big change to its version of Android that I’m not happy about. Notice anything missing? There’s no button for an application drawer. LG admitted the G3 and G4’s interfaces were a tad too complex, so in an effort to simplify things, it completely removed the application drawer—one of my favorite features of Google’s stock Android interface. LG said it did this to help “minimize cognitive load” and eliminate any confusion you might have had about whether or not you actually deleted an app from the device, but I believe this will ultimately result in a ton of frustrated users when they realize how much this actually contributes to a messy Home screen. This is one of the major shortcomings of iOS’s interface and I’m bummed that LG adopted it. I would rather have the old Home screen with the cluttered application drawer, because at least then I have the choice to stow every app icon away on another screen. The LG G5 is the closest to a modular smartphone that we’re going to get for now. It’s certainly no Project Ara, but it’s nice to see LG take a risk with its flagship. I could also see LG partnering up with other major brands, like it did with Bang & Olufsen, to make specific modules that bring even more functionality to an otherwise basic device. The only challenge will be getting the general public to buy into the idea of carrying around extra accessories for their smartphone. LG has not announced pricing for the G5, or any of the accompanying modules, but it said we should expect to see the phone sometime in April.